I used the Titan as my basic computer in replacement of my Power Macintosh 8600 from 1997. It was replaced on August 16, 2007, by an iMac of the summer/autumn 2007 version. From May 13til some time in June 2006, it was on repair in order to install a DVD / CD player & burner. Unfortunately, all computer repairers within 150 km from my home town (Silkeborg, Denmark) pass the Macintoshes on to the same place, to a workshop in Aarhus (at Officeline, an authorized Apple dealer) which is not reknowned for its expedience (or its pricing for that sake). It got back in late June. 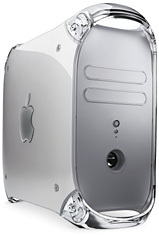 www.apple-history.com's gallery about Power Macintosh G4 Quicksilver.